Seven! That’s the average number of teeth adults between the age of 35 and 49 are missing. For most of us, four of those are unneeded wisdom teeth, but that still leaves three. With statistics like that, it’s pretty likely that you or someone you know has lost at least one tooth. To help you better understand the reasons a missing tooth should be replaced, and the options available, we’ve put together this guide to missing teeth and the options you have when you need to replace your teeth. In an ideal world, every tooth except wisdom tooth extraction Bondi Dental performed would result in dental implants as they are the nearest possible reproduction of natural teeth. However, this isn’t always possible for financial reasons. Here are some of the tooth replacement options for your missing teeth. There are several reasons to be sure a missing tooth should be replaced. Appearance. One of the most common reasons for replacing a missing tooth is to maintain or improve aesthetics. Simply put, a healthy smile with straight white teeth just plain looks good. There are two issues here; one is the issue of an obvious missing tooth, the second is the effect that missing teeth can have on the overall look of your face. Replacing a missing tooth prevents bone resorption – a process in which bone of the jaw disappears if a tooth is missing. The roots of the teeth promote healthy bone development in the jaw. Activities such as biting and chewing stimulate the root structure, which in turn stimulates the bone that the root is attached to. When a tooth is lost, bone stimulation stops and the alveolar bone – the portion of the jaw bone that anchors the teeth in the mouth –starts to resorb. Bone resorption is the natural process by which large cells called osteoclasts break down bone. And what happens if resorption begins? Eventually it, along with the missing teeth, can lead the face to “cave in” and “sag” as the structures that are supposed to support it go away. This can also lead to problems chewing and issues with adjacent teeth and jaw. Function. Perhaps the next most common reason to replace a missing tooth is to keep the mouth functioning properly. Your teeth are there for a reason. They are vital to smiling, communicating, and eating. If you are teeth, it may affect your ability to pronounce certain words correctly and cause speech problems such as lisping. Missing teeth may also harm your ability to chew and digest food properly, thus contributing to poor nutrition. Additional deformation. A gap between teeth can contribute to the development of malocclusion. Misaligned teeth can lead to further problems as the teeth surrounding the gap tend to shift towards each other to fill in the gap. This can lead to opposing teeth to clasingh, potentially increase sensitivity to sweets and temperature, and lead to tooth movement. It can also make it easier for plaque and decay to set in and make future treatment of the area more expensive and complicated. At Bondi Dental we offer multiple solutions to missing teeth, including implants and crowns and bridges. Let’s take a look at these solutions. Dental Implants. This is the most complete solution. Dental implants are artificial tooth root replacements made of titanium, surgically placed into the jaw to replace missing roots so that tooth replacement can be placed. 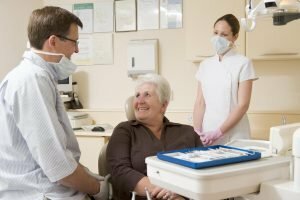 Dental implants are the most “serious” answer as they include consultation, surgery to implant posts, then placement of permanent caps. For more information on implants at Bondi Dental, look here. A bridge is made up of multiple crowns on teeth on either side of the missing tooth, and a false tooth/teeth in between. In some cases, the bridges are supported by implants. If you have missing teeth, it is crucial that you get them replaced. To get started, give us a call at Bondi Dental! Bondi Dental is conveniently located in the Eastern Suburbs – Bondi Beach, Bondi in Sydney. Our exceptionally skilled dental professionals have more than 60 years of combined experiences in all fields of dentistry including tooth replacement. We are open seven days a week 8am – 8pm!